12 Student Victories Out Of The Past #1 On April 18, About 400 students and faculty marched on the Pershing Rifle Drill Meet at the new recreation building.. 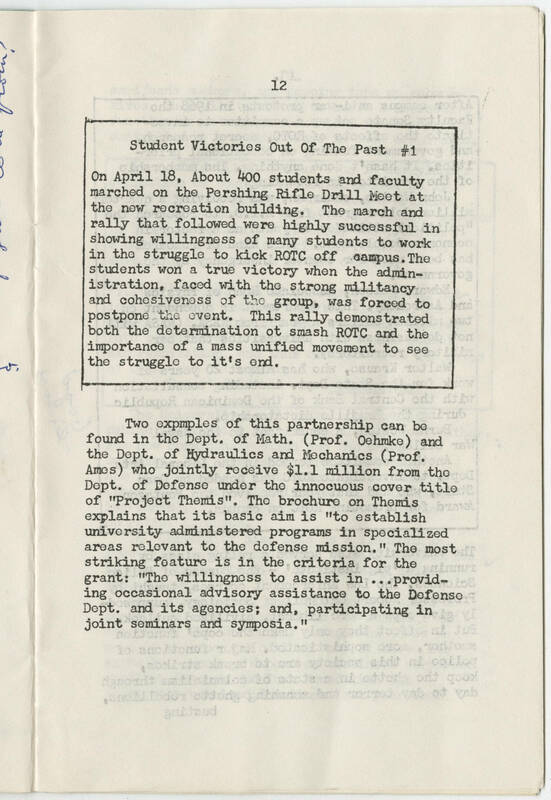 The march and rally that followed were highly successful in showing willingness of many students to work in the struggle to kick ROTC off campus The students won a true victory when the administration, faced with the strong militancy and cohesiveness of the group, was forced to postpone the event. This rally demonstrated both the determination ot smash ROTC and the importance of a mass unified movement to see the struggle to it's end. Two examples of this partnership can be found in the Dept. of Math (Prof. Oehmke) and the Dept. of Hydraulics and Mechanics (Prof. Ames) who jointly receive $1.1 million from the Dept. of Defense under the innocuous cover title of "Project Themis". The brochure on Themis explains that its basic aim is "to establish university administered programs in specialized areas relevant to the defense mission." The most striking feature is in the criteria for the grant: "The willingness to assist in .. providing occasional advisory assistance to the Defense Dept. and its agencies; and participating in joint seminars and symposia."